"Manhunter" -- J'onn J'onzz reveals the details of meeting Kara and Alex's father, Dr. Jeremiah Danvers (Dean Cain, right), and assuming Hank Henshaw's identity, on SUPERGIRL, Monday, March 21 (8:00-9:00 PM, ET/PT) on the CBS Television Network. Frame Grab: ÃÂ© 2016 WBEI. All rights reserved. Tonight’s episode was another solid one after last week’s. What made this episode particularly strong was the backstory of how J’onn J’ozz became Hank Henshaw and we finally see how Siobhan becomes the Silver Banshee. But we open the episode with a news report that indicates how National City now fears Supergirl after she tries to help out during a hostage situation. We see Kara at home watching the report and drowning her sorrows over a box of donuts. Meanwhile, Cat has assembled her CatCo employees admonishing the report for not forgiving Supergirl and giving her the benefit of the doubt. Winn and James wonder to Cat if Supergirl really has lost the faith of the city. Cat then wonders where Kara is and Winn says she called in sick. Cat wonders who will answer her phones and Winn says probably him. When the phone does ring, Winn gets a text from Siobhan so it falls to James to answer the phone. Back at the DEO, Perd’s (that who I am calling Jay Jackson’s news anchor character in honor of his character from Parks and Recreation) news report is all about how an alien infiltrated the DEO. Alex pays J’onn a visit and gives him chocolates. J’onn thinks Alex shouldn’t be visiting him as she could be considered an accessory but she refuses to stop caring and visiting. 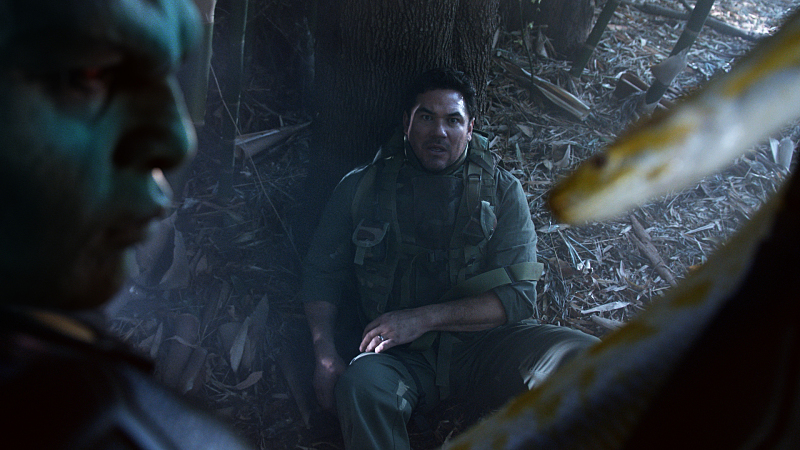 Vasquez interrupts the visit and Alex enters the command central to see the army barge in and take over. Colonel James Harper (Eddie McClintock) and Major Lucy Lane are tasked to finding out what really happened to Hank and who knew that J’onn was an alien all along. J’onn is the first up and welcomes Harper like an old friend. Harper is disgusted at this familiarity and feels betrayed as he welcomed this alien into his home and around his children. Harper also tells J’onn that he has a device that suppresses his powers.The question on everyone’s mind is what happened to the real Hank Henshaw. We flashback 10 years ago and Hank is preparing the DEO for a mission in the Peruvian Andes to catch a Martian. The real Hank is a real douche and Jeremy Danvers is a bit reluctant to go on the mision but Hank forces him to. “Manhunter” — J’onn J’onzz reveals the details of meeting Kara and Alex’s father, Dr. Jeremiah Danvers (Dean Cain, right), and assuming Hank Henshaw’s identity, on SUPERGIRL, Monday, March 21 (8:00-9:00 PM, ET/PT) on the CBS Television Network. Frame Grab: ÃÂ© 2016 WBEI. All rights reserved. As the DEO makes their way through the Peruvian Andes, Jeremiah gets tripped up trying to kill a poisonous snake but J’onn saved him. That night by a fire, Jeremy befriends J’onn and learns that he is the last of his kind and has come to Earth as a refugee. Jeremiah tells J’onn about his daughters and shows him a picture. J’onn shares he had daughters but before their friendly conversation can continue, Hank comes through the woods and shoots J’onn in the leg and pins him down. Jeremiah tries to stop him but Hank continues to shoot at J’onn this time in the shoulder and knows he can regenerate. Hank also tells J’onn that Superman calls him the most dangerous thing on the planet. Jeremy tells Hank that J’onn isn’t dangerous that the two fight. Eventually, Jeremiah throws Hank over a cliff but not before getting mortally wounded in the gut. Just before Jeremiah dies, he asks J’onn to take care of his girls. Back to the present, J’onn tells Harper and Lucy that since he has taken over as the head of the DEO, he as protected Earth from alien threats. Of course, Harper and Lucy don’t see it that way and J’onn is taken back into custody. Outside, Kara tries to use her powers to listen in but is unable to. Alex is next and Harper asks if she knew Hank was an alien when he recruited her. Alex says no and the polygraph indicates that she is telling the truth. We flash back three years ago and we see a totally different Alex, who is a drunken party girl hitting the club scene. When Alex attempts to drive home drunk, she is thrown in jail. “Hank” comes to visit her and tells Alex about knowing her father and being overshadowed by her sister feeling unworthy. “Hank” mentions Alex potential and wants to recruit her into the DEO. “Hank” takes her to the DEO headquarters and explains he will train Alex and she is ready when she can face him. Back to the present, Harper asks if Alex knew Hank was an alien and she once again answers no. Even though the polygraph says Alex was telling the truth, Lucy knows she was lying. Lucy knows Alex sees J’onn as a father figure so takes into custody too. Thanks to Vasquez leaving her head set for Kara, she listened to Alex’s interrogation and wonders where Harper and Lucy are taking J’onn and Alex. Their destination is Project Cadmus. Kara goes to James and wonders what is Project Cadmus. James says Clark told him Cadmus is where they perform experiments on aliens. Kara worries what Cadmus would do to Alex and James tells her Clark doesn’t know where it is. Having no choice, Kara gets James to bring Lucy to her apartment where she reveals she is Supergirl. Lucy is unmoved and thinks J’onn and Kara only have themselves and their lies to blame for why they had hide who they are. Kara then shares what it is like being an alien coming to a new world. We flashback 12 years ago and we see Kara starting to get her powers like superhearing and x-ray vision. A guy asks Alex to meet him and friends at Swann Beach (in homage to Virgil Swann, Christopher Reeve’s Smallville character). Alex is about to refuse as she has to hang with Kara but the guy says bring her along. Kara is amazed at the birds at the beach and mentions to Alex how they don’t have such creatures on her planet. Alex just wishes Kara wouldn’t says things like that. Kara hears something and runs off to rescue a woman and her baby from a burning car. The explodes and Alex is slightly hurt. Later, Jeremiah tells Kara that what hse did was brave but it can’t happen again as they can’t explain again how she did her rescue. Jeremiah gives Kara some lead lined glasses that will help suppress her vision. As young Kara puts them on, we now flashback to three years ago and we see how Kara met Winn and how she got her assistant job with Cat. Back to the present, hearing Kara’s story convinces Lucy to help. In the transport truck, Harper tells J’onn what will happen while at Cadmus. Lucy and Kara arrive on motorcycles. The army opens fire on Kara and the bullets bounce off, allowing Lucy to shoot the tires out of the truck. This allows Alex to destroy the device suppressing J’onn’s powers and he breaks free of his restraints. J’onn uses his mind wide powers so Harper will forget everything but instead learns that Jeremiah is alive and being held at Cadmus. After Harper is taken away, J’onn and Alex go on the run to Cadmus to rescue Jeremiah. Before doing so, Alex and Kara share a good bye. Once back at the DEO, Lucy learns that Harper named her the acting head of the DEO while Kara goes off to stop a bank robbery. Winn gets a text from Siobhan who is getting drunk on mimosas and bemoaning how she can’t get a job and blames Kara and Cat. Winn tells Siobhan that everything will be alright and she can do anything. We later see Siobhan sneak back into CatCo and go on Kara’s computer (seriously haven’t these people heard of password protecting their computer) to write a nasty email to Cat. Unfortunately, this move backfires as Siobhan is invited back into Cat’s office who calls her on her scheme and Winn backs her up. Cat threatens to call the cops on Siobhan is she does something similar again. That night, Siobhan is on a roof top really drunk. Winn tries to calm her down but Siobhan frustration just grows and just wants to scream. Siobhan then breaks her heel then topples over screaming at the top of her lungs. Before going splat, Siobhan’s screams actually slow her fall and she lands safely all the while Winn watches. Now the next question is how does she get the Silver Banshee look? Also, I really am liking Italia Ricci on Supergirl. Ricci looks like she is having a lot of fun. But next week is going to be a cool episode as The Flash is coming!!!! !